the weather has been super cold this past week. it has been so dreary and overcast, and it's been raining constantly. i feel like i haven't seen the sun in days. it's down right depressing. cold weather like this makes me want to curl up in my pajamas. it's definitely soup weather. 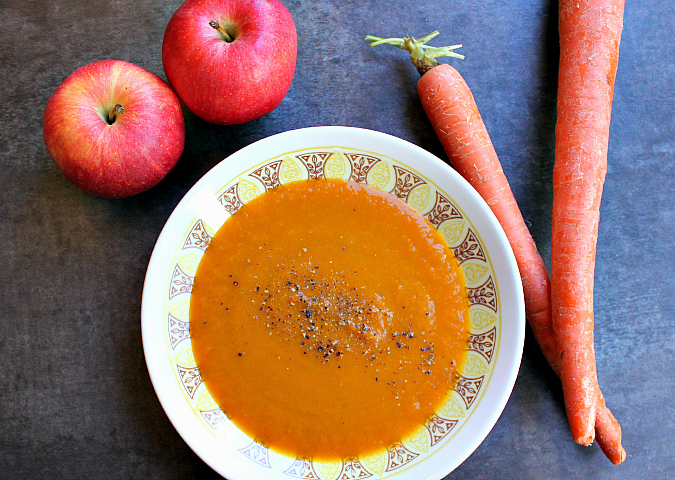 i made a batch of this vegan curried carrot and apple soup recently and we absolutely loved it. it is loaded with onions, celery, carrots, and apples. never thought of putting apples in your soup before? me either . . . but let me tell you, it's a game changer. the flavors of the veggies and the apples are a great combination. the curry powder gives this soup a warm spice. if you're not a fan of spicy foods, you could put less curry powder in, or your could leave it out entirely. 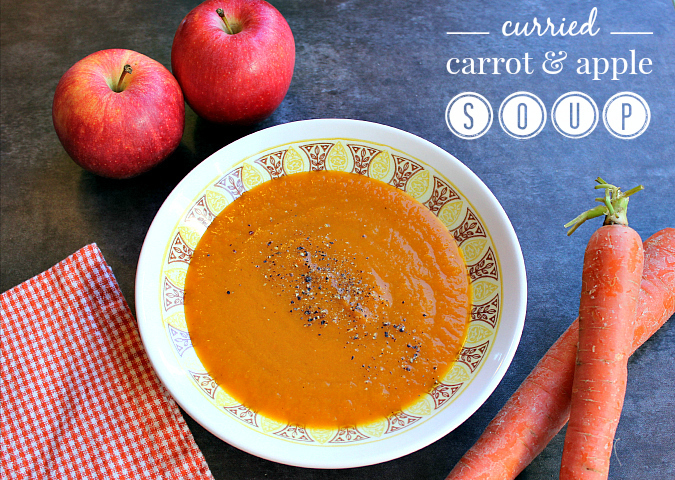 this soup not only tastes great, but it is also super healthy for you and very low in calories! heat the olive oil in a large soup pot over medium heat. saute the onion and the celery until softened and the onion is translucent. (be careful that it does not brown.) stir in the carrots, apples, and curry powder. cook for 2 minutes. add the bay leaf and vegetable broth. bring the mixture to a boil, then reduce the heat to low. cover and let simmer until the carrots and apples are tender (about 20 minutes). remove the bay leaf. transfer the mixture to a blender and blend until completely smooth. pour the pureed soup back into the soup pot. reheat and season with salt and pepper to taste. serve warm. Sounds good. 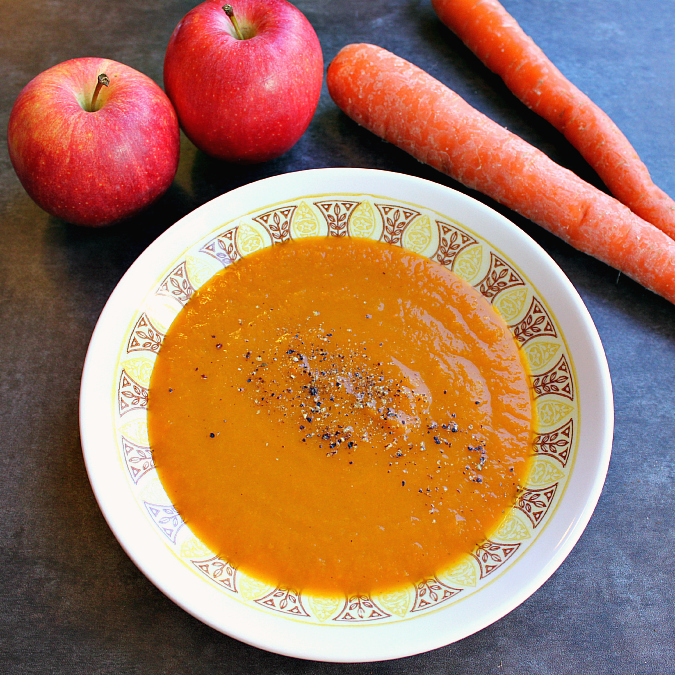 Never thought of apples in soup, but a good idea to give a sweet added flavor. I have cooked with apples and really like that. Will have to try apples in soup.